The “oldest shoe in Norway,” presumed to be of reindeer skin, was found in 2006 preserved in a snowdrift and recently re-estimated to be 3,400 years old. Three thousand years is a long time to innovate (if you live near Toronto, visit the Shoe Museum to see some of those innovations), but in 1916, when Ernest Shackleton and his team set out for the South Pole, they relied on boots and sleeping bags of reindeer skin, custom-made in Norway. The old technology would have served them very well, had they been able to stay dry. Shackelton wrote that by the end of the trek, water had ruined their sleeping bags, leaving them bald of fur, and his men resorted to wrapping their boots with rope to add tread. With over two million dollars and many years of planning, the Shackleton voyage was recently replicated, right down to the reindeer skin, by Australian adventurer Tim Jarvis and British mountaineer Barry Gray, who reached their destination on February 10, 2013. It will be interesting to find out if they had better luck keeping dry. To see shoes being made, check out this video. 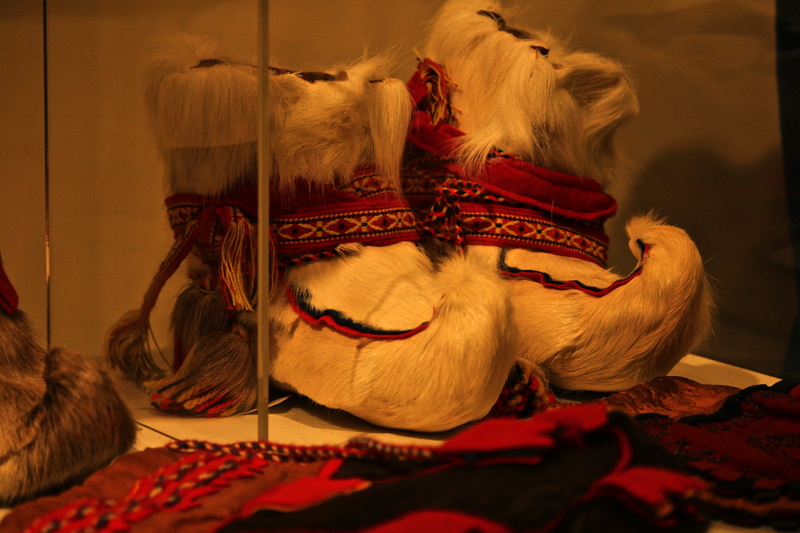 Below is a photo from the “8 Seasons in Sapmi” exhibit at the Nordic Heritage Museum in 2012.